have been removed from this website. This step has been taken to protect the privacy of individuals. The discovery of the final resting place of submarine HMAS AE1, Australia's first submarine, which was lost on 14 September 1914, was announced on 21 Decmber 2017. The recorded history for the Corbould family begins with Richard Corbold. He was born c.1395, probably in Suffolk, England. His exact birthplace is not known. Richard lived in Horham in Suffolk. 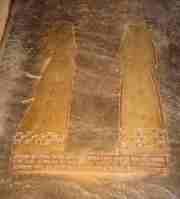 There is a record of a lawsuit between Richard Corbold and Sir William Brandon in 1440. A short distance away in nearby Occold, William Corbald was born c.1450. We presume William was Richard's son, although he may have been Richard's grandson, nephew or grand-nephew. William Corbald and his wife Joanna are buried in the churchyard of St. Michael's and All Saints church in Occold, and there is a brass in memory of William and Joanna in the aisle of that church (see below right). From William Corbald onwards, there is a continuous record of the family's members. In 1935, the Suffolk Institute of Archæology published The Corbould Genealogy written by George B C Poulter. Mr Poulter had painstakingly researched the Corbould family's history and records to produce a text of commanding breadth and detail. That book is available for download, in whole or in sections. The contents are fully text-searchable using Acrobat Reader. The genealogical information is supplemented by biographical information about individual members of the family. Also provided are the results of DNA testing of thirteen males from various countries (identities are not revealed). Some members of the Corbould family residing in England were active as professional artists from the late 1700s to the early 1900s. The work of some of these artists is described and/or displayed on this website. 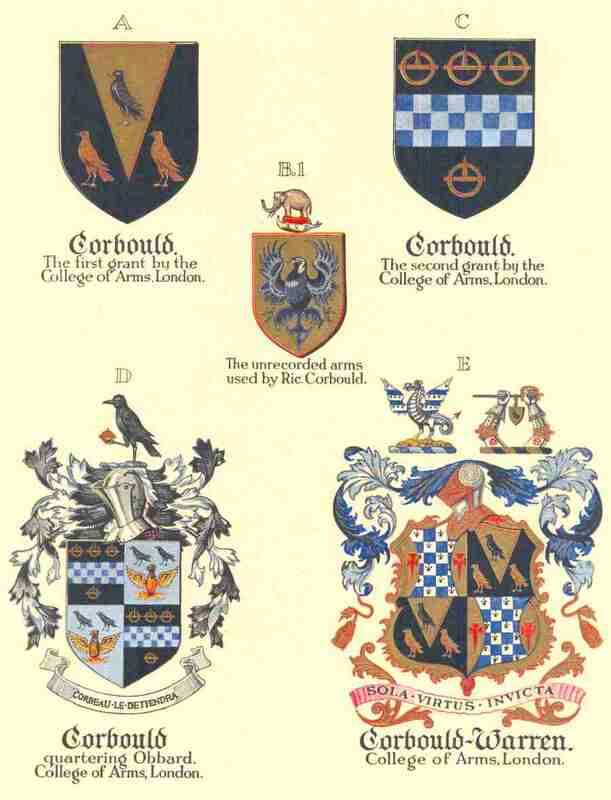 It is likely that people in England and elsewhere with the family name Gorbold, Gorbould or Garbold are descended from the same forebears as those with the name 'Corbould', 'Corbald', 'Corbold' or 'Courbould''. There is possibly an ancestral link with people with the family name 'Cobbold', but male DNA testing results show that there is no common Corbould and Cobbold male ancestor. To request or submit information or to make comments, please send an email to jack at domain corbould.com. The email address has been disguised to reduce spam generated by people who harvest email addresses from websites such as this one.